There’s an old schtick that goes something like First prize is a week in Cleveland; second prize is two weeks in Cleveland. I’m not anti-Cleveland, by the way. It’s the first city that came to mind when I tried to think of places people aren’t yearning to visit. I’m over-justifying my use of Cleveland because you never know what’s going to offend people these days. Or, the other old joke where the plumber says something like The price to fix your toilet is $100; if the homeowner helps, the price is $200. Okay, I’ll stop with the corny jokes. Badda bing, badda boom. 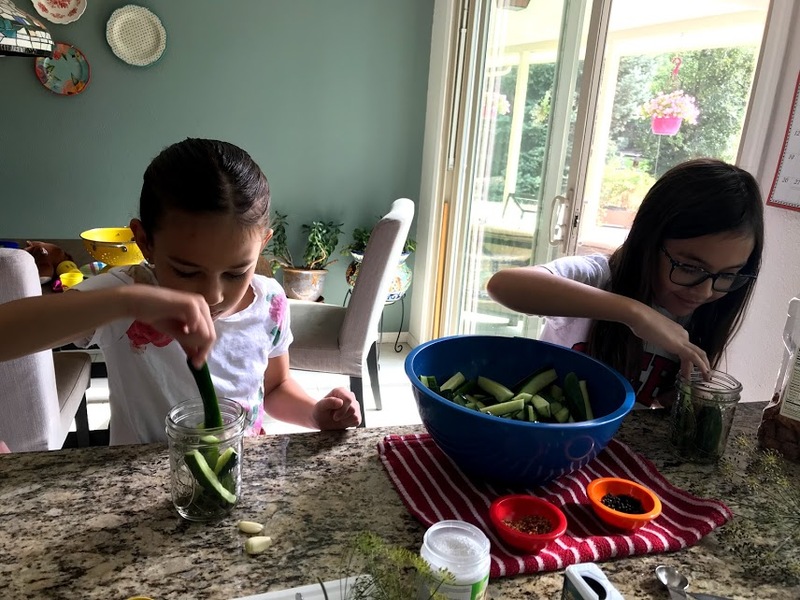 At any rate, the above-mentioned feeble attempts at humor came to mind on Monday when Kaiya and Mylee set out to help me make pickles. My annual pickle-making activity that normally takes about 20 minutes of preparation and another 20 minutes of processing took a bit longer, but was considerably more fun. My grandkids — down to the very last one — are big fans of pickles. Big. Fans. If you think I’m kidding, I will tell you that I opened a pint jar of pickles that I had made earlier this summer, and Cole ate the entire jar by himself. The fact that the pickles were quite spicy didn’t deter him in the least. The whole jar. I’m attributing my grands’ love of pickles to the fact that every last one of them is of Polish ancestry. Also, I make really good pickles. I’ve mentioned that I put up pickles nearly every year. I make cucumber pickles, but I also pickle green beans, because BLOODY MARYS. The other day I went to my favorite farm store and there were plenty of pickling cukes, but also a whole bin of homegrown green beans. On the floor next to the vegetables was a big jar of beautiful dill….. This is a bouquet of dill that Jen gave me last year. Nothing is more beautiful than fresh herbs. It was obvious. Time to make more pickles. And time to teach my granddaughters how to make pickles. (I would also happily teach any of my grandsons, but Cole was the only one around and his attention span — being 4 years old — is about the length of that of a chicken. He played with Play Doh while the three of us worked)….. Hot jars out of the oven. Drop in a clove of garlic, a two-finger pinch of red pepper flakes, a three-finger pinch of black peppercorns, and some dill. Insert the cut-up cucumbers (cutting done courtesy of Kaiya) into the jars, and let Nana add the hot vinegar mixture. Along the way, I explained the process, emphasizing the need for cleanliness and what to do to ensure that a jar achieves the necessary vacuum. “Nana,” asked Mylee. “Can you pickle other vegetables besides cucumbers?” I explained about dilly beans and pickled okra and yellow squash and zucchini. As an aside, last year Dagny and Maggie Faith helped me make pickles. 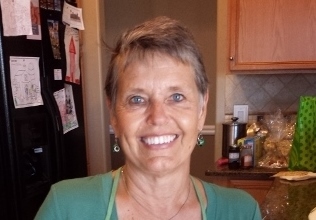 As they prepared to leave, I handed a jar to Dagny, forgetting that they had ridden their bikes over to our house. “Do you want to put it in your bike bag?” I asked Dagny. Nope, she would carry it in her hand. “I’m trying to learn to ride without hands anyway Nana.” Well, of course you are. She made it almost to the curb before it dropped on the cement. By the way, lest I fool myself that I do a better job of pickling when the grands aren’t helping, I must remind myself that last year, I completely forgot to add dill to my dill pickles. Every year without fail I put up at least one batch of dill pickles. I occasionally will make jelly or can tomatoes. I have been known to make dilly beans as well. But the pickles I do each year. 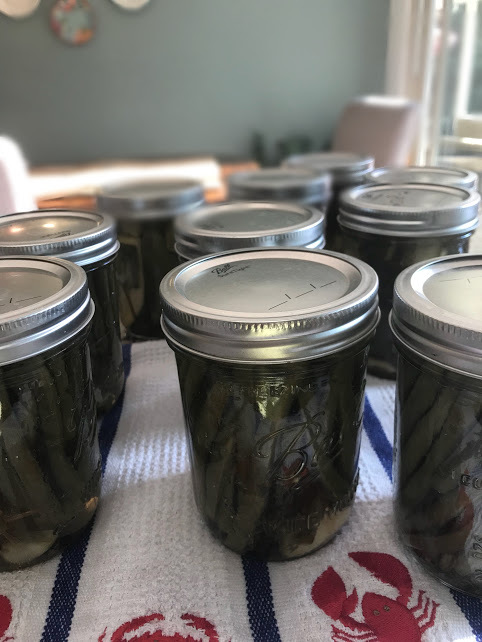 And each year when I make my pickles, I tell people – either by word of mouth or via my blog – just how darned EASY it is to put up pickles, and why-oh-why don’t more people do it. I’m actually quite, well, smug about it. Look at me. I make homemade pickles. Ma Ingalls (of Little House on the Prairie fame) and I and could be BFFs. We could sit around and quilt and talk about pickling recipes and how much butter we were going to churn this week. This year I went one step further and actually grew my fresh dill. I began making noise about going to the Farm Store to buy pickling cucumbers since my dill was ready to pick. It didn’t happen, however, because I went instead to the hospital. Choices, choices…. By time I got out of the hospital, my dill was starting to look sad. So despite the fact that I didn’t feel that great, and despite the fact that my body was still working its way back to normal (a process that’s taking longer than I expected), a week ago I went to the Farm Store and bought four pounds of pickling cucumbers. When I got home, I washed them, put them in a big bowl of ice water, and placed them in the fridge to chill overnight. 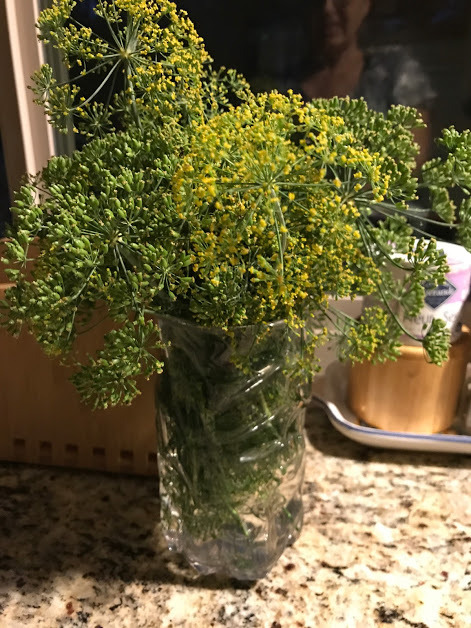 In the meantime, I went out to my garden and picked my long sprigs of dill, and put them in a vase of water to stay fresh until the next day when I would do my pickling. So, the next day, I began the process of putting up the pickles. The process involves sterilizing the jars and lids, carefully washing and cutting the cucumbers, putting the spices (including mustard seeds, garlic, and red pepper flakes) in the sterilized jars, preparing the pickling brine, bringing my massive canning pot full of water to a rolling boil, filling the jars with the cut cucumbers, making sure the rims of the jars are clean, closing the jars, and placing the jars in the boiling water. Perhaps it was because I wasn’t feeling tip top, but at some point during this process it occurred to me that pickling isn’t actually all that darn easy. It isn’t, of course, rocket science, but it is time consuming and somewhat tedious. Nevertheless, for reasons I don’t quite understand myself, I LOVE doing it. I generally don’t eat a single pickle; instead, I give them all to my brother Dave or my nephew Erik. But it is really something I enjoy doing. I had just gotten the jars of cucumbers into the pot of boiling water to begin the process that results in the sealing of the jars. I began wiping the stove and the countertops with a rag. 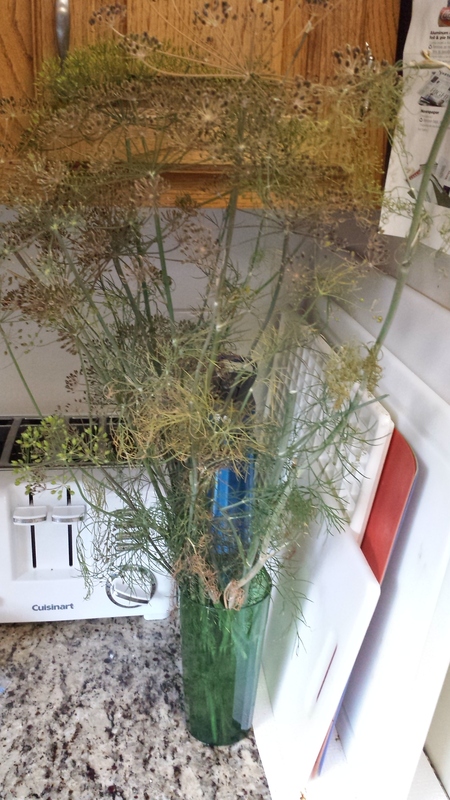 I turned around to place the rag in the sink, and suddenly saw my vase full of dill. “I’ll be a f*****g son of a b***h,” I said quite loudly. I’m not proud of this. “What’s the matter?” asked Bill, who happened to be taking a break from building the playhouse-that-will-never-be-finished. “I forgot to put the dill in my dill pickles,” I said. “Can you add the dill now?” Bill asked. Nope, you really can’t, because by this point it’s basically a chemical process that involves the heat creating a vacuum so that the jars can be sealed. 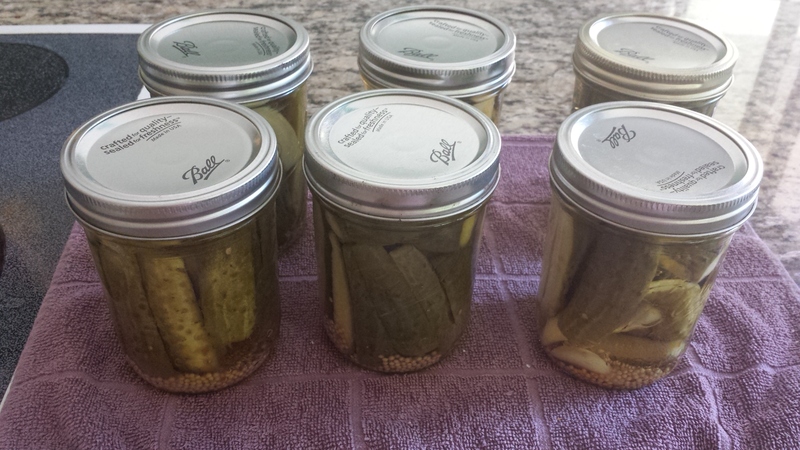 So I finished the processing and will be offering dill-less dill pickles this season. All that remains is for me to come up with a quirky name. Any suggestions? How about Killer Dave’s No Dill Dill Pickles? I thought I might be able to get away with it. Kaiya spotted my jars of pickles the other day and asked if she could have one. I handed one to her. She ate it, but didn’t seem thrilled. I had a few little cucumbers left and didn’t want to throw them away. 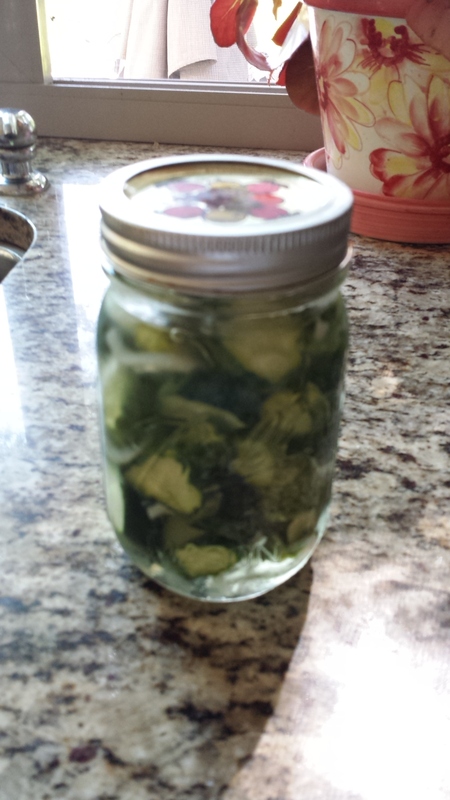 Instead, I made a small batch of my Aunt Leona’s refrigerator pickles, or what she called her Frozen Cuke Salad. Mix and refrigerate 2 hours. Drain and rinse. Make syrup: Bring to boil.. Cool syrup slightly and pour over cukes. Refrigerate another 24 hours. Put in containers and freeze. Leona’s Note: We prefer to keep in frig and eat.